A strong Fremantle Doctor delivered a fast start to the opening day of the 2016 World Match Racing Tour season today in Fremantle, WA. The idyllic Western Australian coastal town of Fremantle saw 20 international crews begin their fast and furious battle for supremacy in the M32 catamarans, a giant leap from the more sedate keelboats traditionally associated with world-class match racing. However, the first two days are all about whittling down the 20 teams to the last 16 with a series of short, sharp fleet races, with the teams divided into four qualifying groups of five. With the fast-reaching starts – another major change to the traditional format of the World Match Racing Tour – the premium on making a quick and pinpoint accurate start is higher than ever. 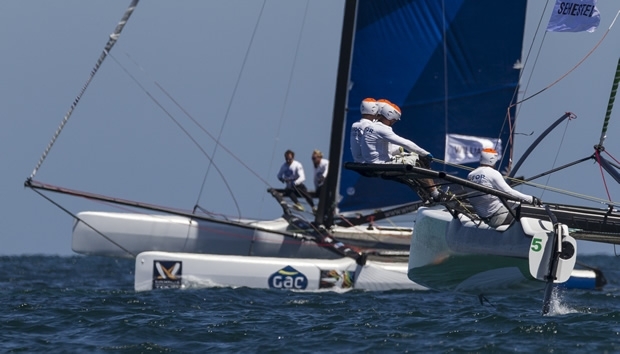 Reigning world champion Ian Williams and his crew on GAC Pindar pulled the trigger earlier than their competitors, and just a second too early for the start gun. The British crew was forced to furl the gennaker and wait for the fleet to cruise past before the umpires released them from their painful starting penalty. At this stage the morning breeze was still soft and fickle. Williams played the classic back marker’s card of desperation – or inspiration - gybing away from the pack in search of something different. The six-time match racing World Champion was rewarded with an extra gust of wind on his side of the course, to sail from last to first by the bottom gate marks. From then on Williams defended his new-found lead to win his first race, and then won his next two. As the day got older, so the breeze got stronger and the later groups were racing in up to 20 knots, hitting speeds of up to 21 knots with one reef in the mainsail. Kiwi professional Phil Robertson brings the perfect mix of experience in world-class match racing and short-course multihull racing. Helped by the likes of 49er Olympic Champion and Volvo Ocean Race veteran Xabi Fernandez, the Kiwi won his group quite easily. While there were clear leaders to emerge from three groups, the last group of the day delivered a very close three-way battle for bragging rights, with Switzerland’s Eric Monnin, Western Australia’s Sam Gilmour and Sweden’s Niklas Dackhammar each taking a race win, but with the Swiss crew topping the group leaderboard. The shock of the last group was to see experienced Aussie match racer Keith Swinton struggling in last place, even with a 2nd place in the middle race. For Swinton’s Black Swan Racing there is local pride at stake and he will be thinking hard about what changes they need to make if they’re to survive their way through to the knock-out stages of the competition, when it moves into one-on-one match racing. For all 20 teams, the learning curve in this new era of racing is extremely steep, and the team that learns quicker than the rest can expect to do very well, both here in Fremantle and for this short season for the World Match Racing Tour which reaches its crescendo this July in Marstrand, Sweden at Match Cup Sweden. Thursday’s racing concludes the qualifying series of fleet racing, and the forecast of a more forceful Fremantle Doctor promises to deliver more spectacular racing for the spectators, both at the venue and live online.